Newly renovated and expanded Panama Canal was reopened by the Panamanian President, Juan Carlos Varela. After the launch a giant Chinese container ship Cosco become the first vessel to move via the newly-enlarged Panama Canal from the Atlantic to the Pacific Ocean. The expanded Panama Canal will allow a new, much-larger generation of container ships to pass through the isthmus of Panama. The Panama Canal expansion project was approved in October 2006 after it was favoured by the national referendum by a 76.8% majority. The project formally began in 2007 and was due to finish in 2014. But its completion was delayed by two years and it is estimated cost was $50 billion. 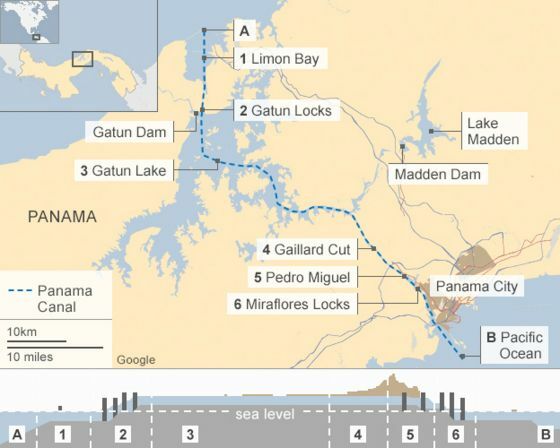 Panama Canal expansion project is also called as the Third Set of Locks Project. The new lane of the canal runs for 77km. It doubles the existing capacity of the Panama Canal by adding a new lane of traffic allowing for a larger number of ships. It also increases the depth and width of the lanes and locks allowing much-larger generation of container ships to pass. It also has raised the maximum operating water level of Gatun Lake. Overall it will have a direct impact on economies of scale and international maritime trade. The Panama Canal is an artificial 77 km waterway that connects the Atlantic Ocean with the Pacific Ocean. The canal cuts across the Isthmus of Panama and is a key conduit for international maritime trade. Strategically and economically it is one of the most important waterways in the world providing the shortest sea link between East Asia, North America and Europe. Its opening in 1914 had provided alternative route to lengthy sea voyage around the southernmost tip of South America via the Drake Passage or Strait of Magellan. France had started work on the canal in 1881, but stopped it due to engineering problems and a high worker mortality rate. Later US took over the project in 1904 and opened it in August 1914. The canal was taken over or completely nationalised by the Panamanian government in 1999. Now it is managed and operated by the Panamanian government-owned Panama Canal Authority.